Join us for our ninth martial pilgrimage to the "Land of the Morning Calm", one that will change the way you view your Taekwondo practice forever. Train at the famed Kukkiwon, the World Taekwondo Instructor Academy in Yangsu-ri, the Kumgang Taekwondo Center, Golgulsa Temple located high the the mist covered mountains of Kyongju, and Dongyang Dojang on Jeju Island. 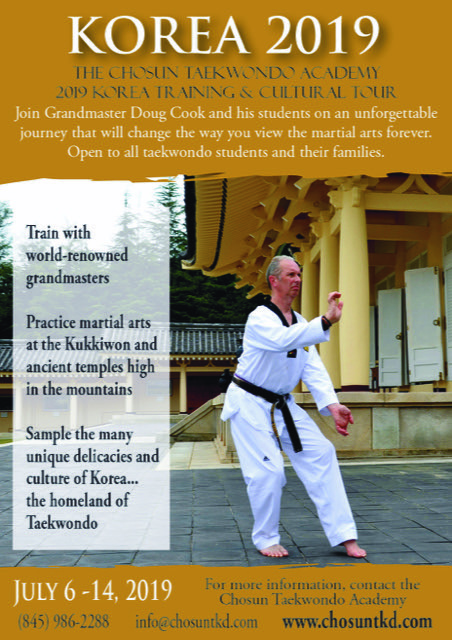 Experience the culinary delights and rich culture that is KOREA...the cradle of Taekwondo. The all-inclusive $4400 price covers: round trip airfare, all meals, lodging at 4-star hotels, all training and sightseeing fees, English-speaking guide, and luxury motor coach while in Korea. Contact us at info@chosuntkd.com for further information or to register.